Twenty years on from the end of steam, Merchant Navy “Clan Line” was seen on the Blackmore Vale Expresses from Salisbury to Exeter, with grateful thanks to Gerald Daniels the then Area Manager. Bullied Battle of Britain 34067 “Tangmere” and West Country 34092 “City of Wells” are also seen on specials, some far away from their comfort zone. But back to 1967. The majority of the engines at the end were unkempt but not unloved by their drivers, with many a tale being told of a Bulleid Pacific thundering along the track at over 100mph! 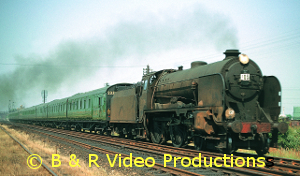 Most of this volume concentrates on the last steam main line from Waterloo to Bournemouth and Weymouth, but we also take a trip across the Solent to the Isle of Wight to see the Victorian Adams 02 class 0-4-4 tanks. These really useful engines, were sent to the Island by the Southern Railway in the 1920s to replace the ancient engines inherited from the various Island railways. They lasted to the end of steam on the Island, and one W24 “Calbourne” has been preserved. As well as the more glamorous express engines, we see Urie and Maunsell S15s, Maunsell N & U class Moguls, Bulleid’s Q1s and the USA 0-6-0 dock tanks. Standard Class 4s & 5s are seen, working alongside Standard Class 3 and 4 tanks. LMS Black 5s and Ivatt tanks are also seen plus A4 60024 “Kingfisher” and A2 60532 “Blue Peter” on enthusiast specials. So pour yourself a glass of Tizer, tuck into that individual apple pie and sit back and enjoy the DVD. Cover photo:- Keith Pirt/Courtesy Book Law Publications, Schools Class 30926 “Repton” passing Paddock Wood, 1962. The magic and variety of the Southern is seen in this latest volume in our series. From the mighty and powerful Bulleid Pacifics and BR Standard locomotives on the main lines to the West Country to the tiny Brighton Terrier 0-6-0Ts on Hayling Island. 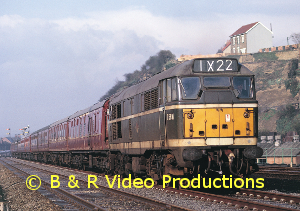 Even a nice cameo of 35028 “Clan Line” from the real days of steam to early preservation. It is not all Bulleids though as we also feature BR Standards and Maunsell locomotives including a Lord Nelson and a Mogul on the West London extension plus a Schools Class 4-4-0 at Reading. A veritable feast of A1X Terriers follows with them working in their home county of Sussex at Seaford, Newhaven and on Falmer bank double heading with a Brighton E6 Radial tank. More Terrier action is seen at Brighton and Brighton Works before we cross into Hampshire to see them hard at work in their last stronghold of the Hayling Island Branch. 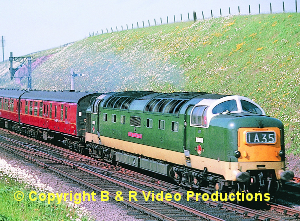 Brighton’s E4 radials are at Horsham and there is even rare footage of Brighton Atlantic “Beachy Head” near Brighton! 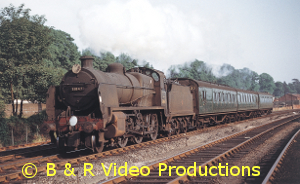 Many Maunsell classes are seen in action with U and N Class Moguls, S15 and Q classes on rail tours in Surrey and Sussex (including the “Cuckoo Line”) and S15s and Q1s hauling freight trains through Byfleet, Walton, Clapham Junction and Micheldever. Travelling away from the Southern, Class U 31639 and Q1 33006 double head a railtour into the Midlands and we see them at Kineton, Wilmcote, Leamington, near Rugby and Wellingborough. 31639 certainly gets around as she is next seen on her home territory at Fareham. There were many BR Standard classes hard at work on the Southern from Britannias to 9Fs. We see Class 5s, 4s (both 4-6-0s and 2-6-0s), Class 4 2-6-4 and Class 3 tanks working all over the region including the much lamented Somerset & Dorset. There are even shots of 77014 and 78038! 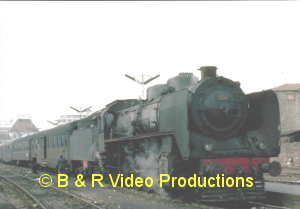 Ex-LMS engines also worked on the Southern. 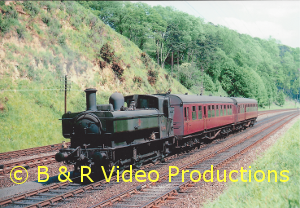 We see Black 5s on the Waterloo to Dorchester main line and the S&DJR, an 8F at Feltham, a 4F and a 2P 4-4-0 at Evercreech and Bournemouth West plus Ivatt “Mickey Mouse” 2-6-2 tanks at Weymouth and Shepton Mallet Tucker Street. The Great Western even gets a look in with footage of three Halls! We finish with the last days of steam on the Southern, with light engines running to Salisbury for disposal, and 35030 on the up 14.11 from Weymouth, the last steam duty of all. All the archive film is in glorious colour with a short sequence in ‘black and white. An authentic soundtrack has been added along with an extensively researched commentary. Cover photo:- Cover photo:- Keith Pirt/Courtesy Book Law Publications, “N” Class 31847 entering Exeter St.Davids, 1961.